So, it seems that this year I may have missed the pumpkin band wagon. I feel like we were so overloaded with Halloween candy, that I couldn’t justify making more sweets for the house. I have been itching to make pies of all sorts, but here we are, just a week until Thanksgiving and I am afraid I’ve missed my chance! Have you already made your menus for turkey day? Or are you a last minute planner? I like to plan ahead, but I am always open to new ideas with a few days left to strategize and do any necessary ingredient shopping. 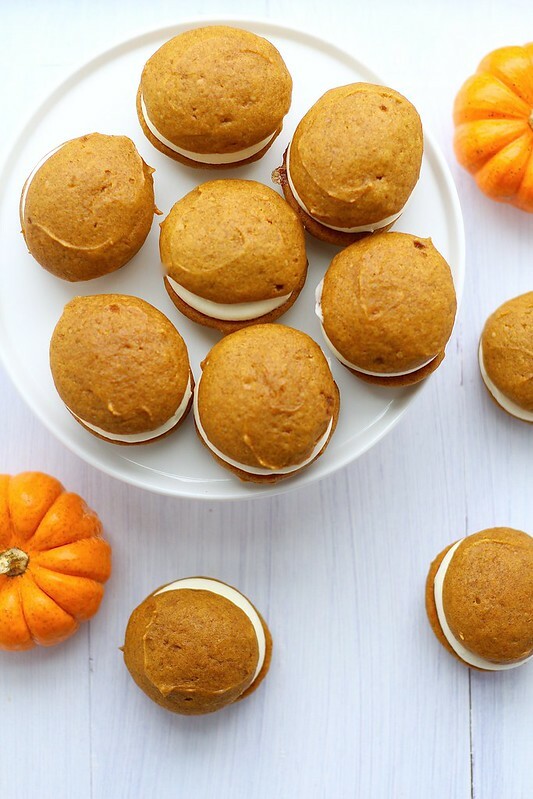 So these whoopie pies aren’t exactly a “traditional” dessert for Thanksgiving, but why not mix it up a little! These are extra delicious, really quite simple to make and practically bite sized. The sandwich part is particularly moist, so making the day of serving is recommended but not one hundred percent necessary. 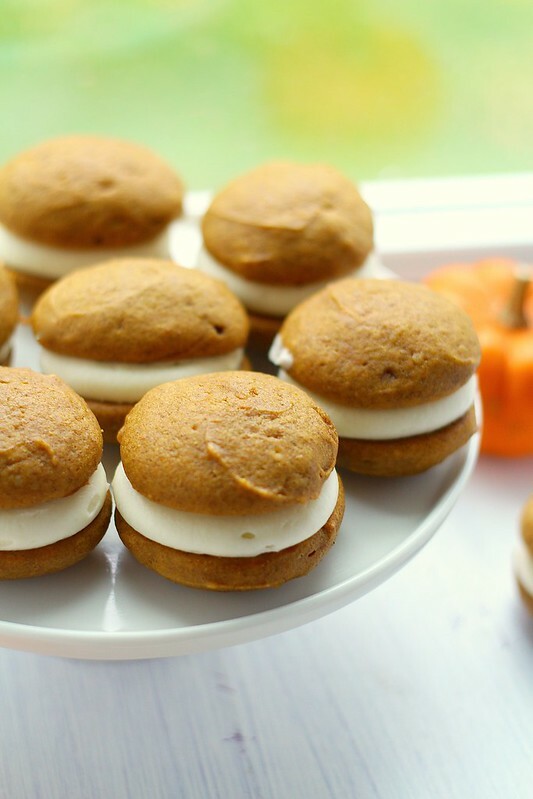 Perfectly spiced, filled with irresistible cream cheese frosting, these make the perfect little finger dessert for any Fall occasion. 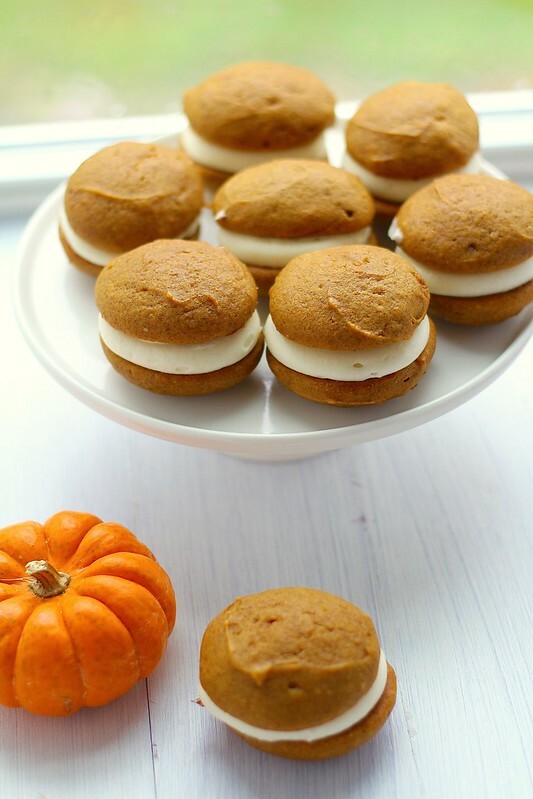 To make the pumpkin cookies, preheat the oven to 350° F. Line two baking sheets with parchment paper or silicone baking mats. Set aside. In a large bowl, whisk together the flour, salt, baking soda, baking powder and spices. In a separate bowl, whisk the sugars and oil together. Add the pumpkin puree and whisk to combine thoroughly. Add the eggs and vanilla and whisk until combined. Whisk the flour mixture into the pumpkin mixture just until combined. Transfer the cookie batter to a pastry bag fitted with a large plain round tip, or use a small cookie scoop. Pipe small rounds of the batter onto the prepared baking sheets, about 1 1/2-2 inches in diameter. Place in the oven and bake for about 10-12 minutes, until the cookies are just starting to crack on top and a toothpick inserted into the center of a cookie comes out clean. Remove from the oven and let the cookies cool on the pan for about 10 minutes. Transfer to a wire rack to cool completely. To make the filling, combine the butter and cream cheese in the bowl of an electric mixer fitted with the paddle attachment. Beat on medium-heat speed until smooth, about 2 minutes. Add the confectioners’ sugar, maple syrup and vanilla and beat until smooth. Transfer the filling to a pastry bag fitted with a plain tip, alternatively, spread the filling on the cookies with a small icing spatula. To assemble, pair the cookies up by size. Pipe filling onto the flat side of one cookie of each pair, and sandwich together with the remaining cookie. Refrigerate for at least 30 minutes to firm before serving. These are best the day they are made, but they will last up to 4 days in the refrigerator well wrapped.